Every lamp is an original! The fascination of the salt crystals is based in the various shades and individual forms of the crystals. The lamps are produced mostly by handicraft. No chemical additives are used. The magnifying atmosphere of a salt crystal lamp is not only due to the warm light. Salt crystals emit neutralizing ions, thus improving the climate of a room. When illuminated, this effect is supplemented by vibrations of light. Different institutes are conducting scientific studies in this field. A salt crystal lamp will enhance the atmosphere of any room. You will be fascinated by the natural light and the uniqueness of your new lamp. The small crystal lamps weigh between 2-3.5kg, the larger lamps weigh 15-20kg. Each lamp makes a statement of its own. All of the lamps include a solid wood base. Are there benefits to having a Crystal Salt Lamp? Salt crystal candleholders and lamps are highly suitable for daily use in the whole house or even in your office. They are perfect for Reiki practitioners, doctors, dentists, massage therapists, reflexologists, therapists, as well as just regular folks. In bed rooms, in living rooms, in dining rooms, in the hall way, in meditation rooms, near televisions, computers, and around smokers. Use these beautiful lamps in offices to reduce fatigue. The lamp will minimize the effect of computer and office equipment radiation, and beautifies surroundings of your work area. They can improve your concentration and refresh you by neutralizing the effects of an artificial environment. Use the lamp in waiting rooms to create a relaxing atmosphere, during massage therapy, and anywhere else you want to restore or maintain the natural air quality. The benefit of ionizers is well known. While most ionizers on the market are man made machines, the salt crystal lamp is a beautiful alternative of mother nature, without any noise and NO harmful OZONE! Europeans have been aware of the HEALTH BENEFITS of salt for generations, and people suffering from chronic congestive problems go to clinics located in salt mines for treatment! It's called SPELEOTHERAPY. The very dry, negative ion-rich environment of these salt mines helps to clear out the patients' bronchial tubes and sinuses, and kills bacteria and other microbes. Perhaps you have noticed that your feeling of well being is intensified in pure mountain air, at the seashore, or after a thunderstorm. This is due to the higher concentration of negative ions in these surroundings. t is no coincidence that healing spas are, as a rule, located in areas with foaming salt water or roaring mountain springs which generate plentiful negative ions. They also cause air particles to achieve electrical or ionic balance. How and where can I use a Salt Crystal Lamp? On a night table next to where you sleep. On your desk, close to your computer. In your living room, close to where you spend time in the evenings. In your meditation or reading room. In your bathroom or powder room. Salt Crystal Lamps make wonderful gifts. Besides being beautiful to look at, they are enriching to your environment. They provide the same ion-rich condition found at the seashore or close to a mountain spring. What an AMAZING gift that gives so much by just sitting in your home. Salt has hygroscopic properties, which means that it draws water from the surrounding atmosphere. Salt Crystal Lamps should therefore never be sprinkled with water, kept in a moist room or be placed outdoors. Sometimes, in particularly moist or humid conditions, the lamp surface may be slightly damp to the touch. Lighting it for a few hours dries it very quickly. If crystallization occurs, just wiping with a damp cloth will get rid of it. For most everyday situations, this is not a concern. It is recommended that you light your lamp every day for the best air purifying results, and you can leave your lamps on for as long as possible. This will not only maintain a constant negative ionizing process, but also repel excess moisture build up around the lamp. If you plan not to use the lamp for longer periods of time, just put a plastic bag on the lamp as prevention from humid conditions. Keep out of reach of children. Always unplug the lamp before changing the light bulb to prevent electric shock. If you choose to place a Salt Crystal Lamp on a wooden surface, please ensure that it has a waterproof base so that you do not damage your furniture. These are natural room ionisers, providing a beautiful warm glow to enhance the room's atmosphere. A beautiful gift or treat for yourself. If the lamp is next to a television or computer monitor, it's effect, through its electromagnetic field, of the device is in approximately the 100-160Hz zone. Our brain waves however, produce only 8Hz according to the Schuman resonance frequency. Therefore, the body is exposed to up to 20 times higher frequency patterns than it is generally used to. The consequences of this exposure results in nervousness, insomnia and lack of concentration or concentration weaknesses. In addition, there will be an accumulation of more free radicals in the body, known to be a cause of cancer. In addition to this, the colours of the salt crystal stones have a healing effect. The therapeutic value of the coloured crystals can reorganize the epidermal layer of our skin. Tests made with kids having ADHD symptoms have shown that after only one week of exposure to crystal salt lamps, their symptoms subsided. After removing the lamps, the symptoms returned. Facilitates a feeling of security and is helpful to our nervous system and our mind and activates the kidneys and bladder. Encourages intellectual comprehension and activates the pancreas, liver and gall bladder. Strengthens the vital life force and activates the heart and circulation. Has a cleansing and detoxifying effect and represents the healing aspect. Helps to find ones own balance and supports earthiness. It's a well know fact that, through scientific and empirical research, salt crystal lamps exhibit biophysical characteristics, which demonstrate a positive effect on our well-being. From a scientific view there are three natural action principles at play: ionization , the electromagnetic oscillation and the transparent-crystalline structure developing the light waves. Before we discuss the above mentioned characteristics of the salt crystal lamps in detail, we would like to point out that salt is a primal element, like water and air and its natural minerals and trace element have unique biophysical and biochemical characteristics. Salt is to be regarded as neutral, chemically as well as physically, without its own polarity, always balancing and neutralizing. Exactly like our planet earth's makeup, human beings consist of about 70% water; brine water more specifically. This enormous potential on enclosed brine solution transmits the cosmic oscillation (vibration) energy, not only evenly over our planets, but also reaches deep into our most minute cells and nerves. It is not only the salt from chemical view that the body needs salt in order to maintain our entire bodily functions, but the salt, from biophysical view , will always be able to bring the body back into its natural energy vibration rhythm. World-wide laboratory tests with the most diverse kinds of measuring methodology furnished the proof that the lit salt crystal lamps deliver ions to our environment. Primarily, the research points to an increased number of negative ions. The emission of ions is primarily caused by the alternating actions of the salt's ability to first absorb water, then evaporate it. To explain this more precisely, the heated salt crystal attracts the water molecules from the ambient air to its surface. The salt goes into a solution as it mixes with the water molecules. Sodium, as the positively charged ion, and chloride, as a negatively charged ion, becomes neutral and are emitted back into the environment. The uniqueness of this ion emission interrelation is only possible with the mineral salt, since salt possesses this transformation ability with water due to it's electrically neutral atomic structure. Scientific investigations of the last decades proved clearly that a balanced ion relationship with a little surplus of negative ions, can have extremely positive affects on our entire physical condition and our health. The heated salt crystal lamps can be referred to, according to research, as natural ion generators. Here however it is pointed out that the emission of ions by heated salt crystal lamps, should not be regarded as the primary characteristic, because from scientific standpoint, the surplus of negative ions is negligible. More important is it's ability to clean the ambient air. Depending upon size and surface area of the salt crystal used for the lamp, the ambient air surrounding it is measurably cleaned by the transformation cycle of hydrogen and oxygen, as well as sodium and chloride ions. This characteristic is especially helpful for relieving the symptoms associated with asthma and allergies in general. The Earth is surrounded by an electromagnetic belt, and within this belt every form of life comes and goes. Therefore, every form of life on this planet earth depends on the power of this electromagnetic field of vibration, known as the Schuman resonance frequency , which states that the given frequency of this electromagnetic field is at 7.83 Hz (cycles) per second . This value in known to be the resonant frequency of our earth. The resonant frequency is the most often frequency of measurement applied to mammals and can be measured as the resonant frequency of our brains with an EEG. Also, a salt crystal, in its neutral state, exhibits this exact frequency oscillation value. But doe to our industrialized and technical way of life, the human organism is being affected, particularly in our homes and offices, to artificial electromagnetic wavelengths with the most diverse frequency values, caused by electronics devices. These frequencies have been proven not only to disturb our human organism, but also to promote illness, since they constantly overlap our natural resonant frequency. As a result of this constant exposure to various frequencies, our own electromagnetic energy field becomes imprinted by the frequencies forced upon it, which upsets the natural development of our cells. Because of the atomic structure of the salt, which is already neutral, it is most likely that the artificial frequencies can be harmonized or balanced by the lit salt lamp as it works as a natural amplifier for the resonant frequency of 8-10 cycles per second, which is so necessary for our life. With the use of a salt crystal lamp we can adjust and neutralize electromagnetic wavelengths caused by electronic devices in natural way. When we talk about light we mean, for the most part, the oscillation energies, or electromagnetic wavelengths, which lie in a nanometer range visible to our human eye. From the colour therapy it is well-known that the human organism needs the light waves of the rainbow spectrum (300-700 nanometers) for the health and preservation of the body. Our body's cells are supplied by light with new energy in the form of electromagnetic wavelengths. Thus the atomic structure of each individual cell vibrates in its own given order and can radiate bio photons as the cell's own electromagnetic energy field. The specific oscillation values of salt crystal lamps depend upon crystalline colour structure in the so-called warm clay/tone range of 600-700 nanometers. For decades, the field of medicine, has been using irradiation with monochromatic light, since these colour vibration areas exert direct influence on our cell producing functions. To what extent a salt crystal lamp can be employed for natural irradiation therapy, is yet to be seen without further research. However, salt crystal lamps have been used therapeutically for years. Today, at the beginning of the 21 st century we can hardly, if only, imagine living without many electric devices. They make it easier for us to work in the office, at home, they entertain us. However, we often do not realize that they are also a source of very harmful positive ions, the so-called electric smog. The harmful effect of electric smog, resulting in the concentration of positive ions, deteriorates the condition of air in rooms, what then negatively affects our physical and emotional state. - dryers, vacuum cleaners, microwave ovens, etc. Scientific research has proven that the amount of ions in the environment, acceptable by the human, is ca. 1000 - 1500/cm 3 . In closed rooms where a few people work at the same time the amount of negative ions may fall to as low as 200/cm 3 . The positive effect of negative ions can be experienced on a visit a Salt Mine, by the sea, or walking right after a storm. Now you know how important it is to make sure that the harmful effect of electric smog is reduced to a minimum in the rooms where we work. The cheapest and the simplest method of fighting against electric smog is to air rooms regularly, particularly those in which a few people stay together for some time, in which there are many electric machines, or where cigarettes are smoked. You can also use air ionizers, but these are quite expensive. To help you remove electric smog, we offer a SALT LAMP . Made of a salt crystal, it is a natural air ionizer that effectively boosts the number of negative ions in the room. The effect of air ionization by salt originates from physical and chemical properties of salt discovered many years ago. In salt lamps the ionization effect is additionally enhanced by heating the salt crystal with a bulb installed inside the lamp. As a result, the lamp improves the quality of our environment, and thus our well-being. In addition, crystal salt helps much to cure many diseases. Bioenergotherapists and homeopaths in Western Europe have recommended crystal salt lamps for a long time to support treatment of allergies, respiratory system and blood system diseases. They are often used in the treatment of rheumatism. Due to its beautiful and rich colors, salt lamps are also used in the color therapy, i.e. chromotherapy. Their soothing light helps neurotic persons and people suffering from insomnia. The lamps have also been appreciated by Feng Shui art connoisseurs. The curing properties of salt was proven by the fact that salt miners much more rarely suffer from respiratory system diseases. Long-term scientific research on the effect of salt mine microclimate on human health have resulted in establishing an underground sanatorium in the Wieliczka Salt Mine. This place has earned great appreciation of people suffering from respiratory system diseases. Now you can also have a 'micro salt mine' at your home. Our lamps are made of a salt crystal excavated from the depth of 600 m, which evolved in consequence of natural geologic processes many millions years ago. The lamps are hand made, taking great care of the natural crystal beauty. 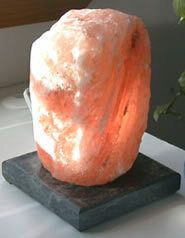 product, a natural salt lamp. Choose a salt lamp to accommodate the size of a room for which it is intended. The amount of negative ions emitted by salt lamps depends on their size. If you don't know which lamp to choose please use the table below. Naturally, the larger the lamp or the more lamps in one room the larger accumulation of negative ions in it.